SugarDaddyForMe VS RichMeetBeautiful | Which Online Dating Site is The Best? SugarDaddyForMe VS RichMeetBeautiful: Which Online Dating Site is The Best? Compare professional reviews of the two sites. In order to help you to find which online dating sites may represent the better choice for you, we have compared SugarDaddyForMe with RichMeetBeautiful, based on 7 major characteristics of the dating service: Popularity, Match Probability, Features, Ease of Use, Safety, Plans & Pricing, and Help & Support. RichMeetBeautiful was launched in August 2013 in Europe. However, in just a short span of time, it became one of the best and most visited sugar dating sites. As the name suggests, this online dating platform caters to wealthy men and women who are searching for adorable and young individuals. This site aims to help someone find love and care and at the same time offer the satisfaction and pleasure they need. RichMeetBeautiful accepts members from all parts of the globe. With the broad base of members are from the United States and Europe where it was originated. Most of the members are thirty years of age and above. Once you visit this site and click the search bar, you will see that some of the profiles don’t have pictures or no photos displayed. Yes, it may be alarming and hesitant to join this site, but there is no need to fret because RichMeetBeautiful has safety measures to validate them. Keep reading our honest RichMeetBeautiful review to learn more. Signing up for this site is easy and fast. You only need two to five minutes to complete the registration. You also need to answer some questions like, “are you a sugar baby, toyboy, or a sugar mama or daddy. You also need to indicate if you are interested in women, men or both. Before moving on with the registration, a captcha box will show and you need to check that box before answering the next questions. You will also ask whether or not you want to subscribe the premium membership. You can go on with the process leaving behind the box unmarked, but make sure to check the captcha security box. If you take this for granted, the website will not allow you to proceed to your registration process. Next, you will need to give some of your personal information like birth date, password, username, and type of lifestyle you have. Once finished, you will receive a notification through email to verify the account. You can do this by entering the code provided. This is the last step in completing the registration. After verification, you can complete the profile or do something else. Other personal information might be added or altered later on. 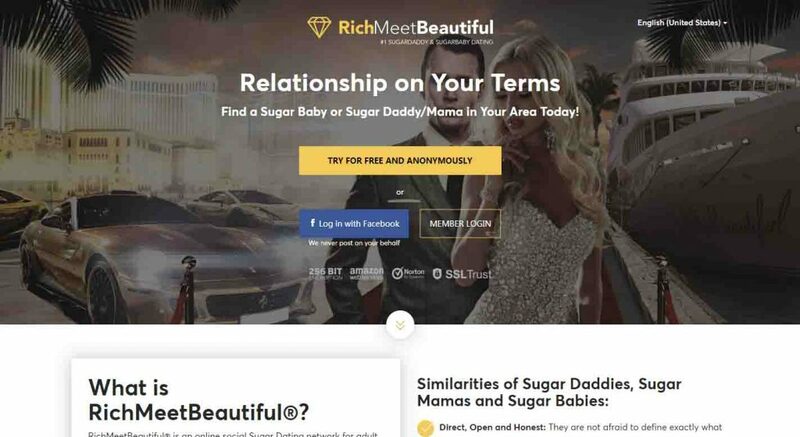 In general, RichMeetBeautiful is a very popular and reliable sugar daddy and sugar baby dating sites based in Europe. This caters to affluent women and men who are looking for sweet and loveable toy boys and sugar babies, and ambitious, goal-driven, young people, who wish a happy and fulfilling lifestyle.